Posted February 27, 2016 by Heather Michet & filed under Aromatherapy, Crow Living, DIY, Essential Oils, Recipes. Do you know how contradictory it is to read the ingredients label for a “natural” product and it takes a dictionary, a cup of tea, and 10 minutes to get through all of those chemistry names? It doesn’t make sense. Take shampoos, for example. The typical commercial – even “natural” ones – can have an ingredient list a mile long and even after reading it, you still don’t have a clue what 99% of those words are describing, let alone whether they are helpful or harmful to your precious body. Take back control of what goes on, and therefore into, your body and make your own body care stuff. Start with shampoo because it is so incredibly easy. It’s super gentle on your wallet too. 5 drops of pure essential oils, such as Rosemary or Roman chamomile. Do not use citrus oils as they can be irritating to the skin. Check with a professional Aromatherapist for help in selecting oils that are safe for you to use. 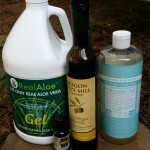 Add all ingredients in the order listed to a plastic bottle with flip cap spout (use a reclaimed shampoo bottle!). STIR gently, do not shake, until all ingredients are incorporated with one another. There are no gums or thickening agents in this so it is runny vs. globby. It is concentrated so start by using 1 tsp., depending upon how much hair you are washing. In my thinking, natural means simple. Most of the time it also means pure materials that have little to no alteration from then they were in the ground or the plant from which they’re derived. This recipe fits the bill for simple and natural!